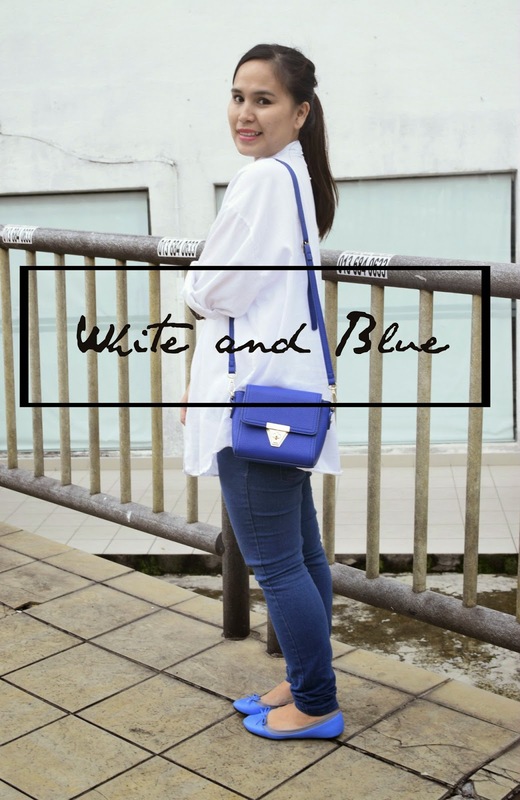 Outfit Sunday: White and blue | First outfit diary 2015! Hope you have a wonderful and beautiful day today! As usual, my Sunday mean went to Church and hanging out with my friends to catch up hot and sometime not so hot issue, just talking to each other is enough to make us smile. And here is my first outfit shoot this year! Yeah!! I am so happy to back to this routine. 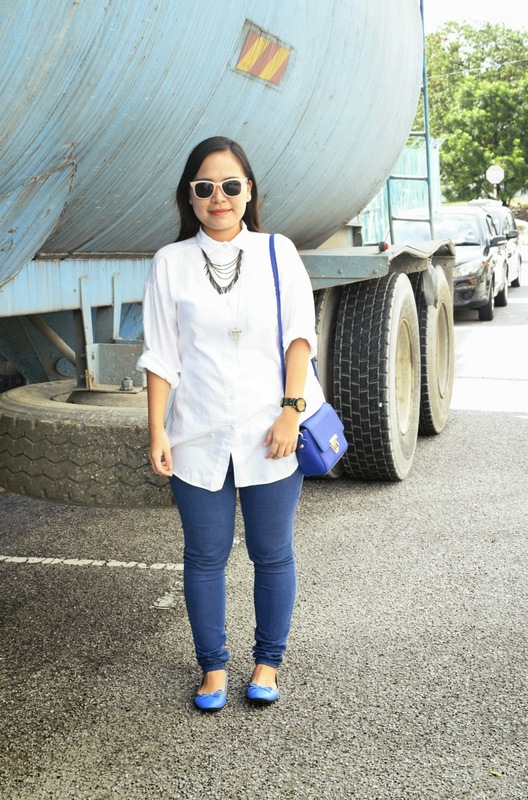 As for today, I wore my white shirt with blue jeans. 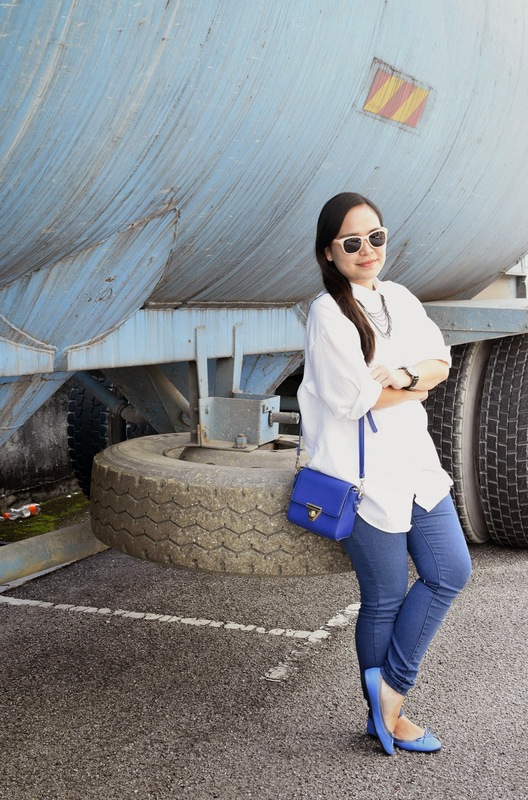 I realized that I am very big fan of white and blue, most of my outfit was blue and white..haha. Should I move on this year? But, I am having fun with this color..hehe. This shirt quite big for me as you can see but that doesn't matter because I feel free move with it and I feel so comfortable whenever I wore it. Okay, without further due..let's see my outfit today. Tips#1 : Whenever wear plain color like white color, it better to wear some necklace on it. This time, I love the silver necklace. or pairing it with your pop color handbag.Totally no no for white handbag! For today, I wearing my "fun" sunglasses because I didn't bring my favorite one. To end the post, let do the "cool" pose!ahaha.. Thank you so much for visiting and read my blog today. Hope you having fun with your life and be happy always. Say NO to Monday blues!